(CHRIS) We were awakened by bright sun and loud birds. After a breakfast of Fruity Tooties, we headed for the public beach. $5 parking so we could keep an eye on the car. It was awhile before the V-ball nets went up, but we rented a ball for free. As a team, we were undefeated today (5-0), but we didn't play the best people there. Plus we played some against each other. We also swam in the ocean alot. We made our own lunch there--PB&J mostly. It was a fun but hot and tiring day. Sunburn report: No major casualties. My head feels a bit burned - I didn't realize my hair was that short. Matt is burnt just a bit on one arm. The other two feel a bit of pain on the shoulders. We're about to go through Houston. Then three hours to San Antonio, where we'll probably camp. (MATT) I'm "amazed by Texas!" I pictured Cacti and sand once we left the Gulf--not so! It's fairly flat (not as bad as Indiana) and it is green and appears fertile. Our campsite was like a rainforest, green hot and muggy. Not at all what 1 was expecting. 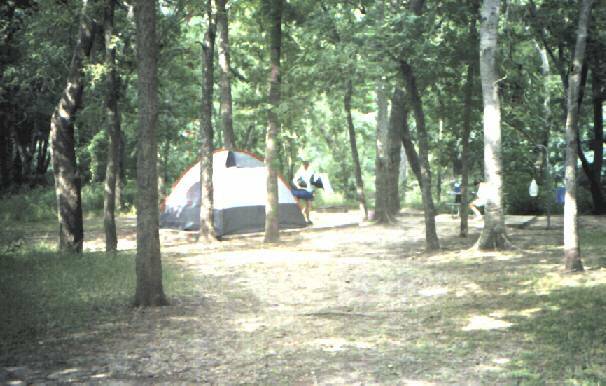 We stayed in Palmetto State Park ($12) and feasted on clam chowder and speghettios (while Jon was an the phone with you know who). We three (Sam, Chris, and I) went to the tent to rest and say the rosary until Jon returned. I fell asleep during the 4th decade while the others finished. Jon returned during my slumber - ate and washed up. The ranger came by sometime later and asked if we had paid. It turned out that Jon who was supposed to pay and sign up when he went to call had not done so. Either confused by the complexity of the directions or by the rush of emotion from that call, he had neglected to do so. He (Jon) paid the ranger when he (ranger) came to our tent and said that he had just sold our spot to someone else. Then we slept and dreamt... for 12 hours.